On the 4th of June 2018, the "Accordion Café Dortmund" celebrates its 10th anniversary with a great music program in the café of the Fritz Henßler Haus and invites friends, allies and interested parties. The Accordion Café is the meeting place of the accordion scene in Dortmund (and beyond) and opens the stage for accordion sounds on every first Monday of the month. The Akkordeon Café is an open stage event in the city of Dortmund/Germany where accordionists play for accordion friends, where friends of the harmonica meet. 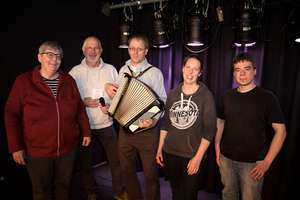 From 2008 on the Akkordeon Café presents all kinds of accordion and harmonica music like Cajun and Zydeco, French Musette, German folk music and shanties, Tango, Country, Pop, Irish Folk, Forro, Cumbia, traditional Balkan tunes, up to contemporary classical music. No entrance fee is to be paid by the listeners and (sorry to say) no salary for the musicians. The Accordion Café is closed on holidays (see timetable). The movie "10 years Akkordeon Café Dortmund" shows the variety of accordion music presented in the Akkordeon Café. Musicians, accordionists, harmonica players, mouth organ artists, soloists, duos and trios, band with accordion, orchestras and music students are performing on our stage. Supported by our professional PA and light show or as in acoustic show they meet and enjoy an accordion enthusiastic audience.